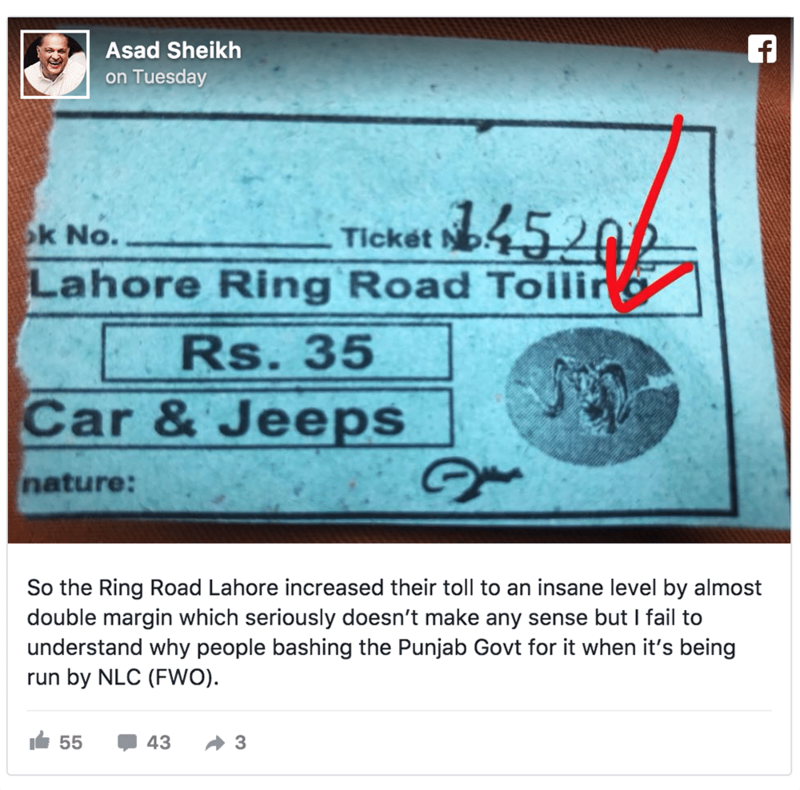 The Lahore Ring Road authorities (LRRA) have silently increased the toll tax from Rs. 120 to Rs. 350 for trucks and trailers. Two days after the inauguration of Southern Loops 1 and 2 of LRR, the authorities increased toll tax by 75% to 192%. The exorbitant increase in toll tax has drawn severe criticism from commuters, especially transporters. If they failed to address our grievances, transporters will be compelled to shut good transport operations in the provincial capital. He said that the LRRA officials have told them that the Frontier Works Organization (FWO) has constructed the road by spending billions of rupees. Therefore, the toll tax had to be paid to the FWO. A large number of commuters, on their social media accounts, protested against the LRR toll tax for cars and jeeps that was increased from Rs. 20 to Rs. 35 per vehicle. The FWO had increased toll tax rates because it has invested around Rs. 20 billion for the construction of this road. As per an agreement with the government, FWO is authorized to further toll tax rates over the next year to recover its investment along with profit. He revealed that the government had shared around Rs. 4.5 billion for the construction and the rest of the investment was made by FWO. The official told that the ring road will be handed over to the government after the concessionary period of twenty-five years. So its 100% legit and fare toll now as Punjab govt is not collecting it? Strange! Not a single comment against it. Can you challenge Pakistan Army?. Can you challenge the General who is heading FWO?. It is a road operated by Pak Army. They are a new Business mafia of Pakistan. If you talk against it then you will be painted as a traitor. So be patriotic and pay your toll-tax on time. yea you also pay wapda bills ontime without even getting electricity why cry now? You must be living in PTI followers state of mind (state of denial) that’s why can’t see electricity without loadsheding. Otherwise electricity is available now 24 hours as promised by PMLN. yeh jo imf se loan lene ap ka ladla poch jata hai woh kon wapis kare ga? as Promised by PML-N for PML-N majority area! and you must be living in that area, otherwise rest of the 99% of Pakistan is still cursed with load-shedding. FWO is a semi army semi pvt organisation and not owned by Federal/Provincial govt of Pakistan. Its a complete failure on the part of this Shahbaz Sharif to give its people a proper road with their tax money. Rather seeing the worsening situation of traffic he called FWO for help who put in all the money in construction of the road and now its their right to collect back the spent money. BLAMING ARMY FOR EVERYTHING INSTEAD OF FINDING THE FACTS IS A FAVOURITE HOBBY OF ALL THE NOORAS AND PATWARIS. Please get the facts before blaming army instead of the theif SHARIFS.